China’s booming car sales汽车销量 could take a hit 受到冲击this year as the government steps up its battle against pollution. 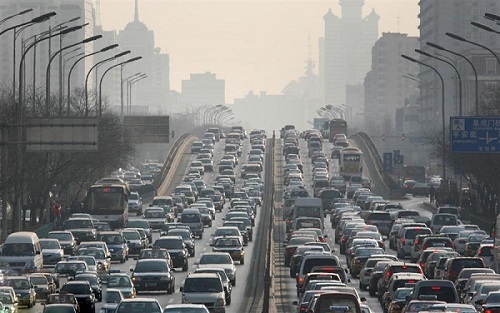 The Chinese government is limiting the number of new vehicle registrations in many major cities this year in hopes of clearing the country’s thick, smoggy air. Sales in the largest cities could be limited to 300,000, while a limited number of smaller cities will have caps closer to 25,000. On top of that 最重要的是, a group of cities are even banning some cars from the streets on certain days to lighten traffic 交通堵塞 and decrease pollution. Auto companies have in recent years expanded rapidly 迅速发展 in China, where growing demand and rising wages上涨的工资have fueled a car-buying boom. China is now the world’s largest car market, cementing the country’s status as a top destination首选目的地for automakers. But now, the government’s new rules are expected to dampen China’s auto-spending spree. In the short term, auto sales could benefit as consumers race to buy cars before the new restrictions are implemented. But that sugar rush won’t last — growth in passenger vehicle sales is expected to slow from an estimated 15% in 2013 to 10% this year, according to a report by Japanese brokerage Nomura.